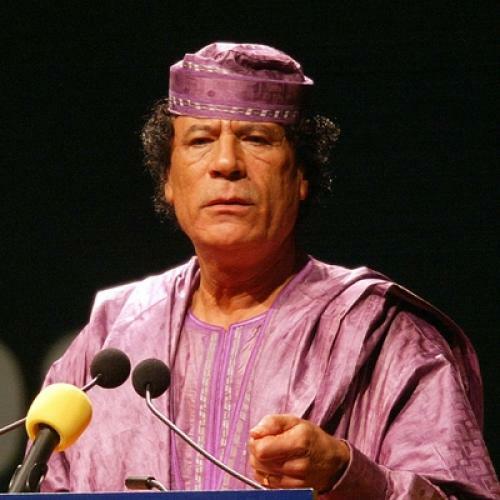 Why right-wing, ultranationalist Serbs love Qaddafi. As Muammar Qaddafi wages war on his own people, whatever international support he once enjoyed has almost entirely dried up. The first to go were his powerful friends in Great Britain; former Prime Minister Tony Blair, who helped rehabilitate the Libyan dictator after he surrendered his nuclear weapons program in 2003, privately urged him to step down. The London School of Economics, which greedily accepted a $2.4 million grant from a Qaddafi-owned charity, has announced it will redirect the funds toward scholarships for North African students, and the director responsible for soliciting the donation resigned in disgrace. Next to abandon the tyrant was the Arab League, which never much liked Muammar Qaddafi in the first place (that’s what you get for allegedly trying to assassinate various members of the Saudi royal family). It may seem strange that those who backed the ethnic cleansing of Muslim Bosniaks and Kosovar Albanians would rush to the defense of a man proclaiming to defend his country from a “crusade against Islam.” But Dragan Todorovic, a leader of the Serbian Radical Party, recently told Radio Free Europe/Radio Liberty (RFE/RL), “Qaddafi absolutely has our support.” (The Radical Party’s former leader, Vojislav Seselj, is currently on trial for war crimes at The Hague). At least one pro-Qaddafi rally has already taken place in Belgrade; demonstrators bore posters with slogans like, “SUPPORT TO OUR FRIEND.” A Facebook group entitled, “Support for Muammar al-Qaddafi from the People of Serbia” has garnered over 65,000 members. “Our plan is for the campaign to shift from Facebook towards the street,” Igor Marinković, of the ultranationalist Naši 1389 told RFE/RL (1389 being the year of the Serbs’ loss to the Ottoman Empire in the Battle of Kosovo). It’s certainly not the first time it’s had to juggle these competing influences: Last year, I attended Serbia’s Gay Pride Parade, which Tadić, under EU pressure, had allowed to be staged under the protection of 5,000 riot police. Much of the opposition to the parade was rooted in religious homophobia, but it wasn’t long before the arguments I heard drifted from typical fire-and-brimstone speeches to the elaborately geopolitical. The protestors, who ended up causing $1.4 million worth of damage, viewed Tadić’s move in support of the parade as a capitulation to the West, part and parcel with his alleged failure to “protect the territorial integrity of Serbia.” When the tear gas cleared, I saw fresh graffiti art depicting the letters “EU” with a cross through them. James Kirchick is writer at large with Radio Free Europe/Radio Liberty based in Prague and a contributing editor for The New Republic.